by Andrew Carroll Editor · Andrew Carroll Author of introduction, etc. 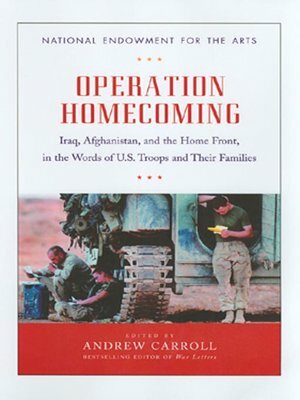 In the summer of 2004, the National Endowment for the Arts organized a series of writing workshops led by prominent authors to encourage US troops and their families to record their experiences and reflections on the wars in Afghanistan and Iraq. The result is this extraordinary volume of first-hand letters, poems, journals, memoirs, and e-mails from the men and women directly involved in battle and their families back home. This uniquely personal addition to the long tradition of war literature covers the entire arc of a soldier's journey, from those first experiences of combat, encounters with Iraqis and Afghans, and the humor and boredom of the daily grind, to the physical and emotional toll of battle, the struggle of loved ones back home to carry on, and finally the return and integration back into American life.